NHK WORLD TV, the stand-alone, 24-hour English-language TV news channel produced by NHK, Japan’s sole public independent broadcasting corporation, has expanded its distribution in the New York market. 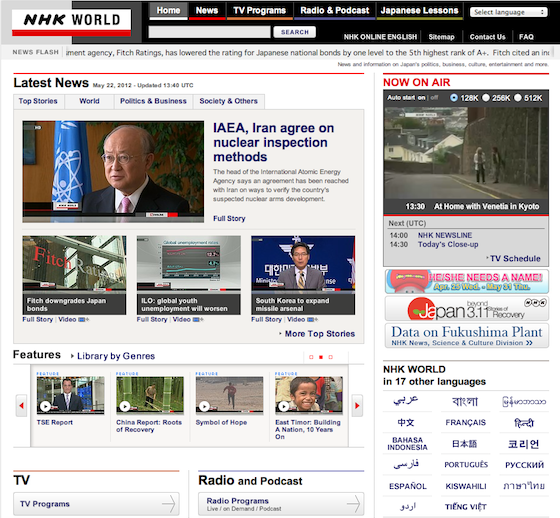 Available to 150 million households in more than 130 countries and regions through local satellite services and cable service providers, NHK WORLD TV made its debut in the New York region last month as a digital broadcast through a dedicated, over-the-air channel on Regional News Network (WRNN – Channel 48.5), which can be seen by six million households in our area. The network is also available in HD to Time Warner Cable subscribers on Channel 771 in Manhattan, Queens, Brooklyn, and Staten Island. Verizon FiOS subscribers throughout the region can watch programming on Channel 482. Now Japan enthusiasts who aren’t fluent in the language can enjoy a wide range of programming generated from Japan. In addition to hourly news updates, there are shows that feature Japanese culture, arts, travel, and lifestyle throughout NHK WORLD TV’s lineup. Learn about Japan’s cultural traditions with BEGIN Japanology and learn to cook healthy Japanese dishes by watching Itadakimasu! Dining with the Chef. Popular Japanese actor/director/comedian Takeshi Kitano (aka Beat TAKESHI) hosts TAKESHI Art Beat, an art appreciation show, while J-pop singer May J. guides viewers through the latest in the Japanese music scene on J-MELO. Two special documentary series on NHK WORLD TV are TOMORROW beyond 3.11 and March to Recovery, focusing on the reconstruction process in the disaster areas following the March 11 earthquake/tsunami/nuclear crisis in Northeastern Japan. In TOMORROW beyond 3.11, foreign celebrities visit Japan and tell stories of recovery from their personal perspectives, while March to Recovery introduces us to survivors and shows us how the nation is recovering. In Japan, NHK (Japan Broadcasting Corporation) operates the country’s largest national and international television network, offering four TV channels (two terrestrial, two satellite, all in digital HD), and three radio services. In addition to NHK WORLD TV in English, NHK also operates NHK WORLD PREMIUM in Japanese as well as international radio services in 18 languages.